In 1916 the condenser microphone was patented in an attempt to increase the sound quality of telephones. After another 84 years, the CAD M179 came along. EC Wente, the inventor of the condenser microphone, would have never imagined his invention would become as widespread as it is today. What's Special About the CAD M179? How well-reviewed is the CAD M179? Even by today's standards, the CAD M179 stands out as a unique condenser microphone. Where most microphones have an option of set polar patterns, the CAD M179's pattern is infinitely adjustable. Rather than choosing individual patterns, the CAD M179 has a knob that continuously adjusts its pattern. This feature makes the CAD M179 a unique microphone that may be just what your setup needs. It's difficult to find microphones that perform similarly to the CAD M179 at its price point. There are cardioid microphones out there that sound better than the CAD M179, but they usually lack pattern adjustment and the ability to record instruments. The closest microphone regarding versatility to the CAD M179 is most likely the Blue Yeti Pro. When it comes to audio quality, the SE Electronics SE2200a II C and Audio-Technica AT2020USB+ are most likely the closest you'll find for a reasonable price. 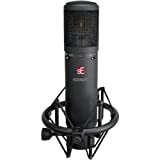 The SE 2200a II C is a large diaphragm condenser cardioid microphone with a smooth sound to it. When it comes to features, the SE 2200a II C has a -10db pad and high-pass filter. Unfortunately, this model is locked into the cardioid pattern, so it's best for those looking to record vocals. As far as frequency response goes, the curve is relatively flat beside two "bumps" at 3-6kHz and at 10-15kHz. 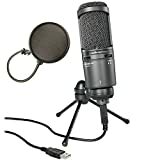 Overall, the microphone sounds admirable for its price and has a warm sound to it. Amazon reviewers tend to agree the microphone is excellent, giving it 4.1 out of 5 stars. You can buy the SE2200a II C in amazon. Another microphone that has great value for its price is the AT2020USB+. This cardioid condenser USB microphone has a clear sound that's due to its generally flat frequency response. Vocals sound excellent through the microphone, and it's still able to record instruments well. On the microphone, you'll find a headphone jack for real-time monitoring. Along with the headphone jack, you'll find a knob to adjust the headphone volume as well as a knob to mix the microphone audio with pre-recorded audio. On Amazon, the mic received an astonishing 4.6 out of 5 stars. You can buy the AT2020USB+ with an affordable price point, making the microphone hard to beat. 15 Hz - 22 kHz frequency response. Headphone Amplifier : Signal to Noise 114dB. Yeti Pro is not capable of simultaneous analog and digital operation. To ensure proper operation, only connect the digital (USB) or analog (XLR) connectors at any given time. In the event Yeti Pro becomes unresponsive, simply unplug all connections for 10 seconds and re-connect your Yeti Pro with the desired output cable. One of the more stylish microphones on the market is the multipattern Blue Yeti Pro USB Condenser microphone. A unique feature of this microphone is that it's both USB and XLR compatible, bringing a lot of versatility to the table. The ease of the USB compatibility is nothing to be scoffed at. Simply plug the Blue Yeti Pro into a computer, and it'll be ready to go. The microphone is also able to record in cardioid, bidirectional, omnidirectional, and stereo patterns. Along with multiple patterns, the Blue Yeti Pro allows you to control the gain and headphone volume of the microphone. There's also a mute button and pattern selection switch for ease of use. The Blue Yeti Pro has a rating of 3.9 out of 5 stars on Amazon. You can buy the Blue Yeti Pro in amazon. The CAD M179 is a large diaphragm condenser microphone with an infinitely variable polar pattern. That means whether you're recording drums, vocals, string instruments, or basically anything else, you'll be able to use the CAD M179. Because of this, the CAD M179 will be a dream for many audio engineers. Whether you're recording a live performance, a solo studio session, or a room of guests for a podcast, the CAD M179 will be ready for the task. There's a fine balance between the pros and cons of the CAD M179. On the one hand, the microphone can be worth its price due to its ability to accurately record more than just vocals. On the other, the overall design on the CAD M179 is less than desirable. For a beginner to a mid-tier microphone, the CAD M179 has most of the features you'd expect. Although it's not packed to the absolute brim with features, it still manages to rise above expectations. On the CAD M179 is a knob that allows you to control the polar pattern of the microphone. You can set the microphone to cardioid, hyper cardioid, subcardioid, omnidirectional, bidirectional, and anywhere in between. The ability to modify the polar pattern as much as you wish makes the CAD M179 a very versatile microphone. And to avoid confusion, there are five marks on the pattern control knob, giving you the ability to switch between modes quickly. The cardioid position is also centrally located and detented to allow you to switch back to the mode when needed easily. The CAD M179 has a 20dB pad so you can compensate for situations where your audio source will be very loud. With a high-pass filter, you can keep your mic from picking up low-frequency sounds. Often if you don't have a high-pass filter you'll pick up sounds caused by a passing individual or vehicle. Someone walking by your microphone stand can cause enough movement to shake your microphone, making a low-frequency "rumbling" sound. Another source of low-frequency sound you'd want to filter out is the sound of an HVAC system. If you plan on taking your microphone outside, then a high-pass filter can also help remove the sound of wind blowing on your mic. Dual diaphragms sit within the CAD M179 that are 1.1-inch gold sputtered. An internal stainless steel pop/EMI filter sits within the microphone as well. Along with the filter, there's a "6dB/Octave @ 100Hz high-pass filter" and a "20 dB non-capacitive pad." The entire microphone weighs four pounds and has dimensions of 10 x 7 x 4 inches. Moving onto reviews of the CAD M179, you'll find a wide range of opinions. It's interesting to see how users react to the microphone because some feel it performs well above its price while others aren't so generous. There are also a few horror stories from users who really didn't enjoy their experience with the microphone. According to the Microphone Geeks, the CAD M179 has a fair amount of value to it. To begin with, they state the microphone has a generally flat frequency response. What this means is that the microphone puts out a consistent volume for all frequencies. They go on to say this is usually a trait of more high-end microphones. The appeal of flat frequency response is that the microphone can accurately reproduce the sounds it's recording. And although the flat frequency response means nothing fancy goes into the recording, the Microphone Geeks say the microphone still manages to have a "warm" feel to its audio. Speaking more about the audio quality, the Microphone Geeks said the CAD M179 captures audio reasonably accurately. They say when playing back the recording of vocals, it will sound like the person's right there. When it comes to the build of the CAD M179, the Microphone Geeks were impressed by the shock mount that comes with it. They say that it's nothing spectacular, but that generally, stock shock mounts are of poor quality. Furthermore, the Microphone Geeks say the design of the CAD M179 is decently sturdy. They say it's not unbreakable or anything, but it will be able to handle the usual wear and tear. The largest disadvantage the Microphone Geeks had to say about the CAD M179 was that it tended to pick up "s" and "t" noises a bit too much. Their suggested fix was just to make sure to buy a pop filter and possibly use a de-esser with the microphone. Along with the sibilance issues, the Microphone Geeks said you might want to look at your options before buying the CAD M179. They felt the mic was a bit too expensive, and that you had a good chance of finding a similar quality microphone for a lower price. Overall though, they had generally positive things to say about the microphone. On Amazon, the reviews for the CAD M179 are glowing. The microphone has 4.4 out of 5 stars on Amazon, with 81 percent of those reviews being 5 out of 5 stars. Reviewers go as far as to say the CAD M179 sounds as good as high-end microphones that cost between $600 to $1,000. That's a bold claim to make for a microphone that ranges between $200 to $300, and yet more than a few reviewers share the sentiment. Moreover, many reviewers on Amazon say the CAD M179 sounds tremendous with vocals as well as with various instruments. It seems the most significant factor holding down the CAD M179's rating is its maker's quality control issues. Some reviewers claim their CAD M179 had self-noise problems. Their microphone would make humming and rumbling noises that ruined their experience with the microphone. That is a big factor to look out for as it seems to be a gamble whether your microphone is going to be great or obnoxious. The mix of outstanding and nightmarish reviews for the CAD M179 causes an interesting dilemma. It seems that if you get a working CAD M179, there's a high chance you'll absolutely love it. However, if you get unlucky, you'll be driven to leave a nasty review about the microphone and its maker. With such a significant fraction of the reviewer base giving the CAD M179 5 out of 5 stars though, there's a chance that the folks who got a bad CAD M179 are a vocal minority. When looking to buy the CAD M179, you'll generally find the microphone between $215 to $315. It's hard to find other multi-pattern microphones for this price, making the CAD M179 a pretty good buy. This is especially true if you see it on the lower side of its price range. The pattern adjustment is a unique feature that gives the CAD M179 a lot of versatility. If you want to take a further look at the CAD M179, you can find the microphone on Amazon, where you can purchase it. Our aim when writing this article was to summarize all of the current reviews and information online about the CAD M179. We wanted to make one spot where you can learn everything you need to know about the microphone to save you your valuable time. To do this, we looked at user reviews and reviews from publishers across the web. We searched the web to find out what the overall consensus was on the CAD M179 from reviewers. After finding out the what reviewers had to say, we then comprehensively summarized that information to show you the best and worst aspects of the CAD M179. If you're looking to record vocals exclusively, you may be able to get away with a cheaper cardioid microphone. However, if you plan on recording vocals as well as other various instruments the CAD M179 could be just the microphone you're looking for. The adjustable pattern of the CAD M179 lets you set up the microphone for a wide range of situations, making it quite the workhorse. And although you can find less expensive microphones, the CAD M179 still manages to bring a hefty amount of value to the table. AKG D5 Dynamic Microphone Review: Should You Buy?